Suitable for vegetarians. Kosher - Parve. Under supervision of Beth Din Machzinei Hadas Israel. 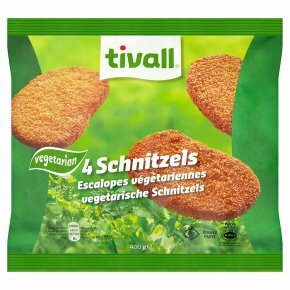 Kosher-Lemehadrin - Rabbi Michael Keller, Rabbinate of Nahariya - Israel.Vegetarian schnitzels Schnitzels made from soya and wheat protein with a crunchy crumb coating. All ovens vary - these are guidelines only. Cook from frozen. Remove all packaging.15-18 min. 180°C, 11 min., 10 min.